Digital games are sometimes paper prototyped as collectible trading card games. Pokémon, Magic: The Gathering, and Yu-Gi-Oh! are examples of this. In 2013 Barry Joseph, at the Museum of Natural History in New York City, co-designed dinosaur trading cards with Nick Fortugno. The deck is called Pterosaurs: The Card Game. There is also a category of trading card game apps on iTunes. One example of a digital card game is Calculords, which features several decks to collect. The strategy game depends on the player’s arithmetic skills. It starts with the learning outcomes, the kinds of actions of “doing.” If you see a kid doing something, you say, “Ah! They get this. They understand this concept.” Start there. Ask what are the types of situations or actions I could get a kid to do that? Ask what would provide a practice space for ways of doing, ways of thinking. Socratic Smackdown came out of that early vision. When we see kids making arguments and debating, we ask what situations can they be put in to arrive at that? That’s how you make games and map out the experiences. I spoke at length with Mission Lab’s Shula Ehrlich, co-designer of Socratic Smackdown. We spoke in January 2014. Ehrlich first heard about Quest to Learn and Institute of Play while taking classes at Parsons the New School for Design in New York City (Katie Salen taught at Parsons prior to her current position at DePaul University in Chicago). She saw the power of games in engaging students and she wanted to be part of that initiative. After 4 years at the Institute, she became a lead designer. A lot of what she designs is close to project-based learning; some of the designs are more game-like than others. We call it exploding the game. Stretching out the capacity of the game as a teaching tool. I think it’s more powerful than playing a game once. The important thing is what surrounds a game. It’s not one discrete thing you play and that’s it. A game is situated in a larger learning trajectory. There are lessons before, related activities, and a period of rolling out pieces of the game. To explode it, the teacher rolls out a simplified version: just one rocket instead of three. You only play the cards on your own board, not others. This gets students acclimated to the rules, the basic structure of the gameplay, and math concepts. Then there is more teaching and related activities, and then back to the game, which becomes more complicated. After that the kids reflect until, finally, the full version. Matthew Farber teaches social studies at Valleyview Middle School, in Denville, New Jersey, and is currently a Doctoral Candidate in Educational Technology Leadership at New Jersey City University. 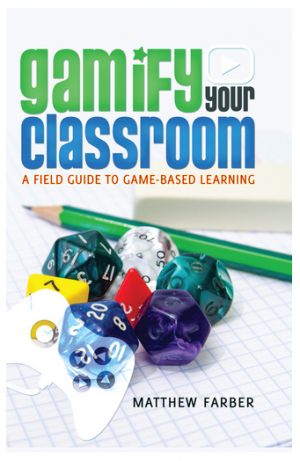 His book, Gamify Your Classroom: A Field Guide to Game-Based Learning, is available from Peter Lang Publishing. You can follow him on Twitter @MatthewFarber.